There are millions of compassionate and loving people in the United States who have been given erroneous information about domestic violence. Over the years the media and academia have offered a steady stream of information that indicates that women are the only victims of domestic violence and men the only perpetrators. We have all been deceived. What most don’t know is that a part of that deception has been intentional and has come from the scientific community. As hard as it is to believe it is indisputable. Most of us had no idea of this deception until recently. More and more is now coming out about the symmetry of victimization in domestic violence between men and women. Let’s go through the seven ways one by one. The first type of deceit that Straus describes is suppressing evidence. The researchers would ask questions about both men and women but only report on the answers from women. The half-story would leave readers with the impression that it was only women who were victims even though the researcher had the surveys of male victims on hand they simply didn’t report it. The data on male victims was simply buried while the data on female victims was reported. Straus discusses the Status on Women report from Kentucky in the late 1970’s that was the first to use this strategy. They collected data on both male and female victims but only the female victims were discussed in the publications. Scientific method is dependent upon creating a hypothesis and testing it. If you get data from your test that is contrary to your original hypothesis this is just as important as getting data that affirms the hypothesis and can be used to adjust your original hypothesis. To ignore ones own data that contradicts the hypothesis is the epitome of disregard to the foundations of scientific inquiry. It leaves the realms of research and enters the realms of propaganda and shaping the outcome to mislead. 2. Avoid Obtaining Data Inconsistent With the Patriarchal Dominance Theory. The second method described by Straus was that of simply not asking the questions when you didn’t want to hear the answers. The surveys would ask the women about their victimhood and ask men about their perpetration but failed to inquire about women’s violence or men’s victimhood. If you ask questions that address only half the problem you are certain to conclude with only half the answers. Straus highlights a talk he gave in Canada where he evaluated 12 studies on domestic violence. Ten out of the twelve only asked questions about female victims and male perpetrators. If you don’t ask the questions you will never get the answers. Publishing half the truth is intentionally misleading. Straus reveals a number of situations where studies or official documents would cite only other studies that showed female victims and male perpetrators. He uses the Department of Justice press release as just one example where they only cite the “lifetime prevalence” data because it showed primarily male perpetration. They omitted referencing the “past-year” data even though it was more accurate since it showed females perpetrated 40% of the partner assaults. Straus shows journal articles and names organizations such as the United Nations, World Health Organization, the US Department of Justice and others who used this tactic to make it appear that women were the primary victims of domestic violence and men the primary perpetrators. coercion and not about self-defense at all but this didn’t stop the researcher from claiming the erroneous results which of course could be quoted by later studies as proof that such data does indeed exist. The “woozle” effect is described by Straus as when “frequent citation of previous publications that lack evidence mislead us into thinking there is evidence.” He lists the Kernsmaith study and a report from the World Health Organization as examples. Both made claims (without evidence to back it up) that women’s violence was largely in self-defense. The claims were quoted repeatedly and people eventually started to believe that the claims were correct. Straus provides details of a number of incidents where researchers who found evidence of gender symmetry in domestic violence were harassed or threatened. He described a number of instances such as bomb scares at personal events, being denied tenure and promotions, or “shouts and stomping” meant to drown out an oral presentation. He relates being called a “wife-beater” as a means to denigrate both himself and his previous research findings. Straus concludes that a “climate of fear has inhibited research and publication on gender symmetry in personal violence.” His words help us to understand the reasons that our public is so convinced that women are the sole victims of domestic violence and men the only perpetrators. It has been years and years of researchers telling only half the story and when we get only half the story and consider it the whole truth we are likely to defend our limited version of the truth and ostracize those who may offer differing explanations. The matter is further complicated due to the media having acted as a megaphone for the half story that has emerged so the “common knowledge” that has emerged from the media for many years has been half the story and due to its not telling both sides of the story, it is basically misinformation.What this tells us is that we need to stay on our toes when it comes to social science research. Straus’s paper has helped us immensely in seeing how research can be set up to appear to tell the truth but fail miserably in doing so. While the researchers are not technically lying, the end product is similar since it produces only a partial image of the reality of domestic violence and leaves people without the details to fill in the reality of the situation. It is likely a good idea to have a look at the way each study gets its data, the exact nature of the people being used as subjects, and the conclusion drawn and if they are congruous with the data that was gathered. Next we will look at a study that uses Straus’s first example, ignoring ones own data. Tom's new book Helping Mothers be Closer to Their Sons offers mothers a view into the secrets of their sons ways. It includes his way of handling emotions, his way of getting what he wants, competitions and much more. Great gift for mom to help her understand your sons. When we know him, we can love him! Available in Kindle EBook for only $8.95 or in paperback at 11.95. 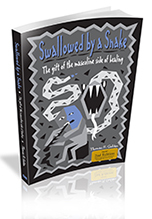 Swallowed by a Snake: The Gift of the Masculine Side of Healing is available now on Amazon. It offers a map for men in working with their grief. A detailed look into the masculine side of healing. Available in paperback or kindle.